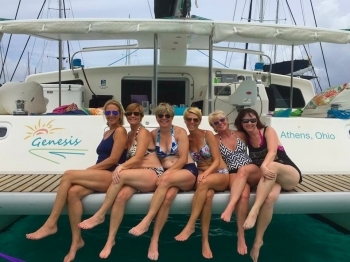 Available year round in the Virgin Islands, the 50 ft. Voyage catamaran GENESIS has Happy Cabins and Beautiful Hors doeuvres. 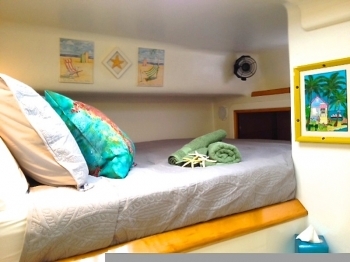 The four guest Queen berths have bright turquoise, green, chartreuse and rose bedspreads respectively, each with lovely wall art. 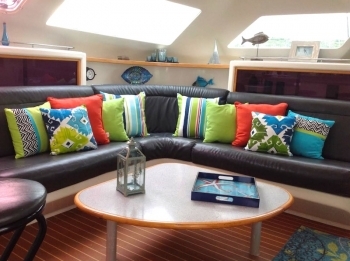 Three are interior cabins….the fourth is accessed over the bow; the crew sleep aft to starboard… Dining tables in the cockpit and main saloon are large enough to accommodate eight. 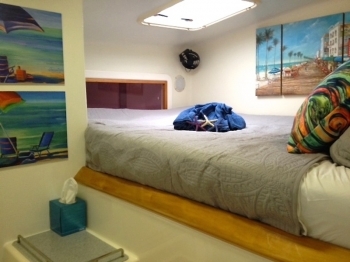 All the beds are comfortable with Memory Foam mattresses. Each guest bathroom is ensuite with electric head, although the showers do not have individual stalls; they are what we call wet showers. 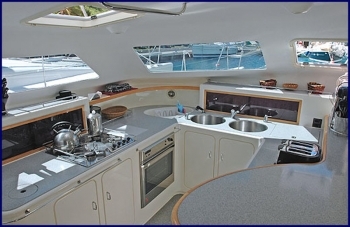 The saloon with lounge to port and galley to starboard is separated by bar stools, and it opens to a attractively appointed, full beam cockpit, offering indoor/outdoor living. 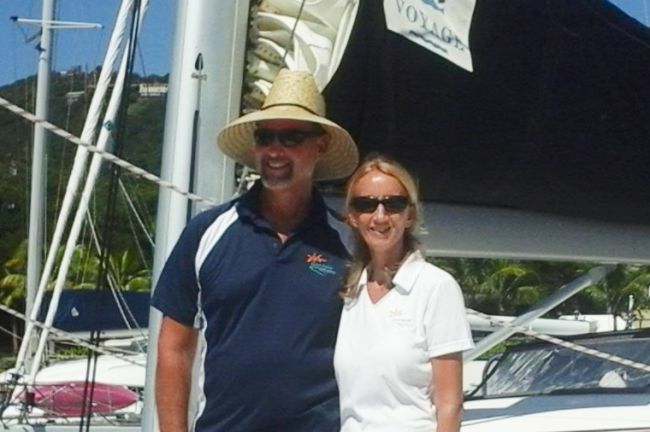 Steve Danwig and Janet Van Leaven from California and Holland respectively are lifelong sailors. 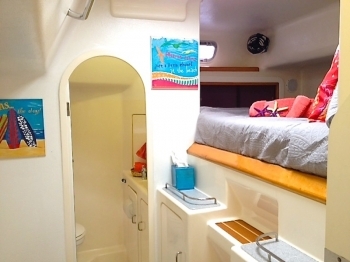 Coming from a family that had boats, Steve grew up sailing the Pacific Northwest and California, where he owned and lived aboard a 42 ft monosail, which he sailed to the Caribbean and still has. 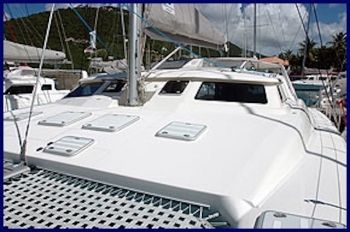 He knows the whole of the Eastern Caribbean well from the Virgin Islands to the Grenadines, having lived in the Caribbean four years. 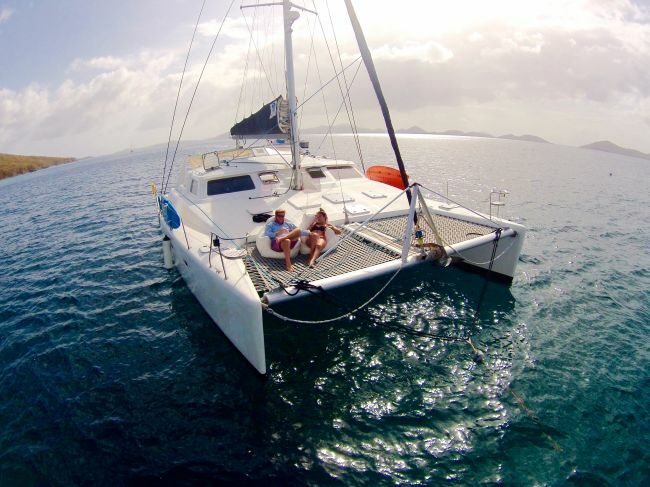 Avid kite surfers, Steve and Janet are both experienced offshore sailors. 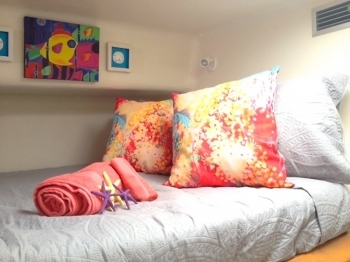 Reviews from their guests confirm that this couple are thoroughly nice, knowledgeable people who do all possible to see that everybody has a good time.